A WordPress theme is a pre-designed website template you can edit using simple drag-and-drop or menu-based editing tools. The best free WordPress themes are easy to install and edit, are highly customizable, and produce websites that are both attractive and highly functional. Below, we’ve assembled the 21 best WordPress themes for business in 2019. To use a WordPress theme, you must first host and set up a WordPress website. Bluehost, WordPress’ recommended web hosting provider, makes it easy. With each plan, you get a free domain name, one-click WordPress installation, five free email addresses, and access to dozens of industry-leading themes. Click here to get started for as low as $2.95 per month. 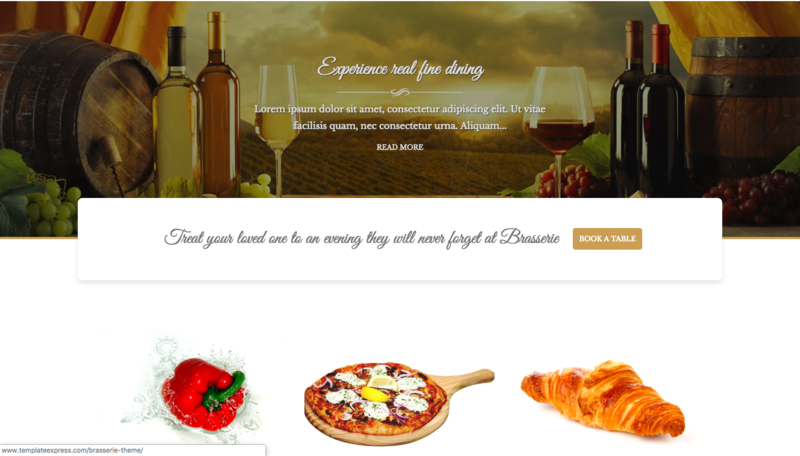 Brasserie is a great theme for restaurants wanting a simple yet elegant theme. Fonts and colors can be adjusted using the customization menu and quickly applied to any element on your site. In addition, you can choose from multiple homepage layouts with elements like a gallery, full-width slider, or side menu bar. To serve international visitors, download the WordPress Multilingual plugin; this allows visitors to translate copy on each page into their native language. In addition to the features above, Brasserie includes a blog page—perfect for announcing new dishes, promotions, or in-store events. It also features specialty pages like a stunning menu of your dishes; a reservation page that encourages website visitors to dine in; and a gallery page to showcase your restaurant’s atmosphere, events, and expert chefs or mixologists. If you cater, you can easily set up an online store by downloading the WooCommerce plugin. 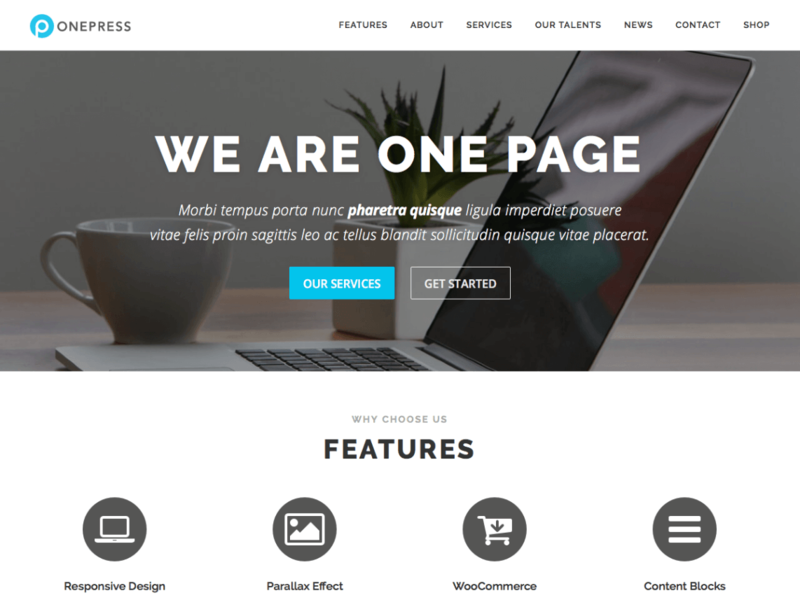 OnePress is a free, one-page WordPress website theme that packs all of your business information into one simple page. Choose content blocks to create team bios, about us information, service details, galleries, and latest news sections that showcase your business’ story, people, and products. You can also choose background images that remain static when users scroll down the page, creating a two-dimensional feel known as the parallax effect. With the help of the popular WooCommerce plugin, product pages can be formatted with product tiles that include images, call-to-action buttons, descriptions, pricing information, and shipment details. Or, instead, set up tables listing service and plan tiers and features. As an easily customizable WordPress theme, OnePress is ideal for businesses needing a clean, uncomplicated website, like ecommerce businesses or startup service companies. 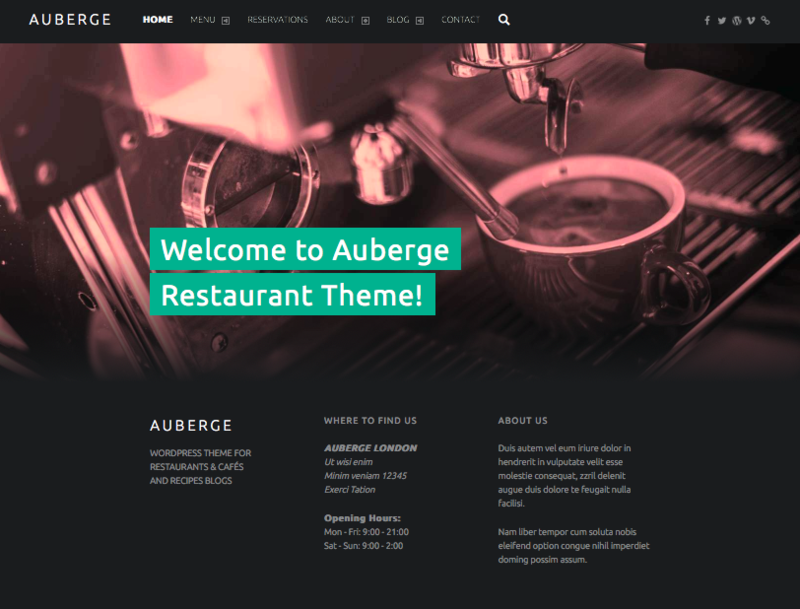 The Auberge theme’s homepage offers a customizable overview of your restaurant’s contact information, description, and menu. You can easily customize the theme’s colors and layout using the compatible Beaver Builder plugin, which is a highly-rated, drag-and-drop web builder. You can also display a gallery of recent blog posts or featured recipes just under the hero image. Dig deeper into your restaurant’s offerings with a menu page and a recipe blog. The reservations page, meanwhile, allows website visitors to book reservations online. Use the header slider on each page to incorporate your own images of your dishes or your restaurant’s events or atmosphere. Travelify is a customizable blog template with ecommerce functionality that’s perfect for a travel agency. To help visitors get excited about destinations, you can upload images of exotic travel adventures to the homepage slider. Then, invite visitors to explore dream vacations via vivid blog posts, complete with image galleries, searchable tags, and social icons so they can share with friends. You can also build an ecommerce store using the WooCommerce plugin. Here, you can display vacation-booking packages and sell travel products like airplane pillows, luggage, pocket language dictionaries, cameras, digital adapters, and other goodies. Just be sure your website hosting plan offers website security like an SSL certificate to protect your customers’ credit card information. 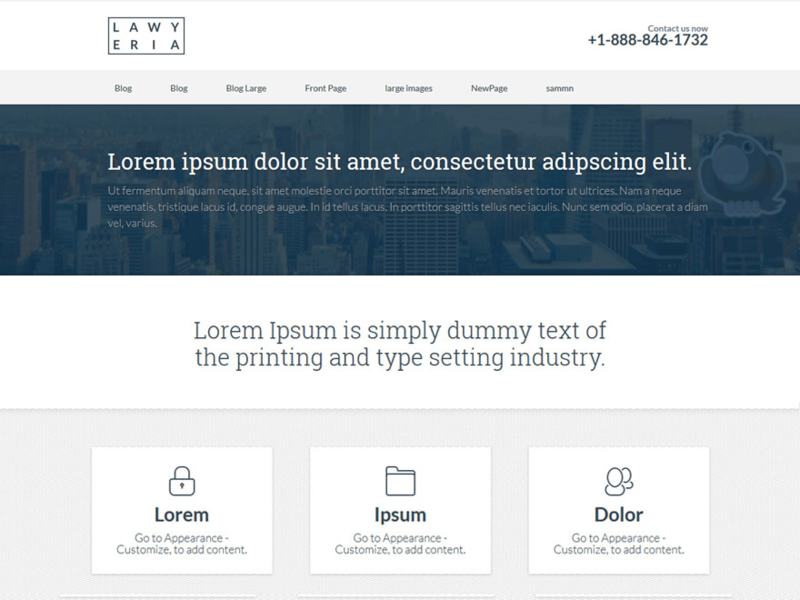 The free Lawyeria Lite WordPress theme is designed to give you a simple and professional legal website that provides your contact information to potential clients as quickly and easily as possible. A contact form sits on the footer menu so people can send you an email, while a “Contact Us Now” call to action in the top right-hand corner of the header makes the push for clients to contact you even stronger. The homepage has three feature boxes for highlighting services. Additionally, the theme comes with a Lawyer page where you can introduce your teams’ bios and their expertise. The Offices page is used to share detailed location information about all of your firm’s physical locations. Lastly, a blog allows you to showcase your legal expertise. 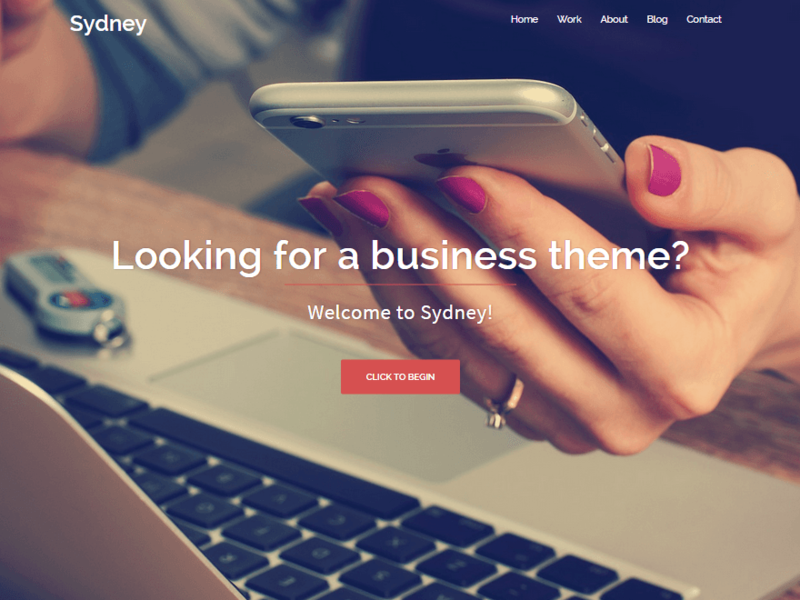 Sydney is a basic WordPress template with a parallax background. Customize your site with a business logo, colors, and fonts. Then, upload images to serve as a static backdrop and create content blocks like testimonials, team bio carousels, portfolios, featured posts, and more. Add custom call-to-action buttons that encourage visitors to click through to blog posts or company information pages. Lastly, build pages to feature your company story and contact information. Without a focus on portfolio content blocks, testimonials, and team bios, this theme works best to showcase services. You can add contact information along the footer or in a separate contact page so visitors can easily connect with a representative. For these reasons, this theme is best for online service and consultation companies. 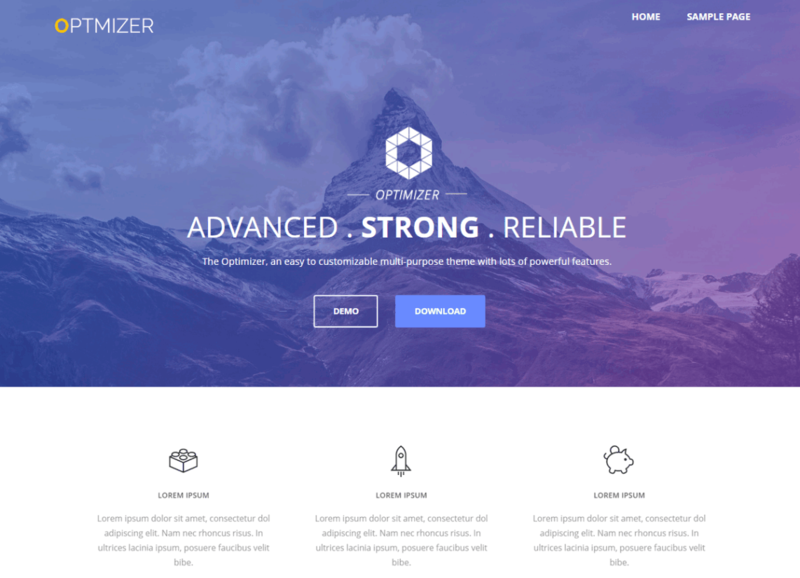 The Optimizer theme offers powerful tools for creating a community around your brand. You can edit every inch of this theme by deleting and adding sections, then editing content using the included sidebar menu. Change colors and fonts to align with your brand image, and add sliders that showcase your products. Once you have the core of your site built, create a community around your brand and its products. You can do so by adding forums to your website with the compatible bbPress plugin. Or, add the BuddyPress plugin to create a social media platform that lives within your website. For example, a fitness coach might use it to connect to clients who want to discuss their fitness goals. 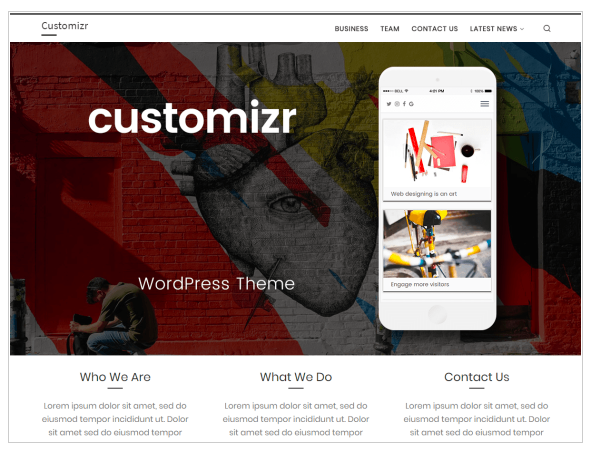 Customizr is referred to by users as the chameleon WordPress theme. When you download the compatible Nimble Builder Plugin, you can pick from pre-built sections to drag and drop wherever you want. Add sections for services, contact information, forms, sliders, and header sections. From there, you can customize text, images, fonts, spacing, and colors to make each section relevant to your brand. This is a highly customizable theme with default about us, blog, contact, and homepage tabs, as well as sections to showcase your services and contact forms. You can then use the Latest News page to blog about your expertise and showcase your work. As such, it is best for small local businesses needing to showcase their services or professional expertise. As a basic portfolio theme for service providers, Adamos is easy to install and customize. Upload your images, business information, logo, and blog posts to showcase your work and encourage people to hire you. You can create an entire portfolio in just minutes with this theme, but you can also get more elaborate in your website design by installing forms or translation plugins. The Adamos theme features a homepage that allows service providers or freelancers to showcase their work for potential clients. You can use the slider to display featured blog posts. Under the slider, there are three boxes for adding links, images, or copy to showcase services. Next is a section for recent posts. There are areas along the bottom and top footer for you to display widgets like social icons, calendars, contact information, and more. 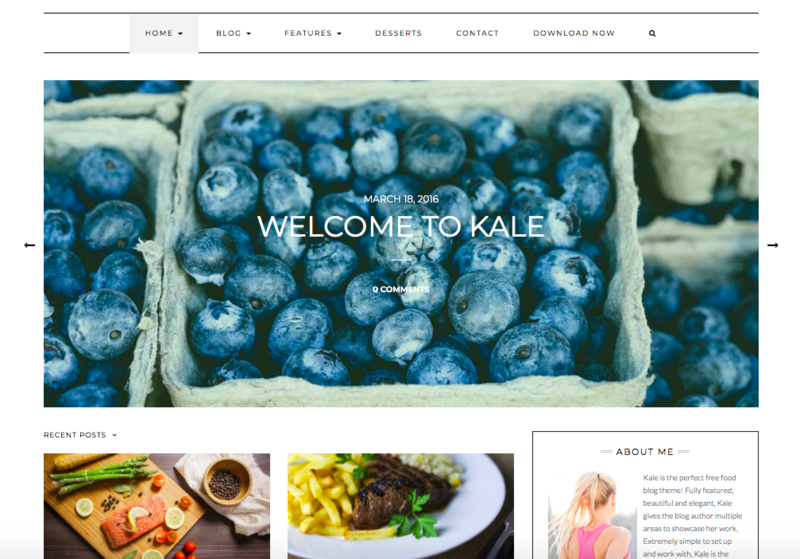 Kale is a minimal, uncluttered, and image-rich blog theme for lifestyle bloggers or influencers. Its homepage features a choice of a featured header slider, banner, or full-width image. Under the slider is a three-row section for showcasing a portfolio or service descriptions. You can change the background colors and images using the sidebar customization menu. If you choose the template with a sidebar, you can feature your social media icons. This theme is compatible with the WooCommerce plugin and the MailPoet newsletter plugin. By coupling these features with an image-rich homepage layout and blog, lifestyle blogger and influencers can showcase their expertise and then sell lifestyle products. For example, a food influencer or affiliate blogger can showcase their recipes via images, a portfolio, and a blog, then sell specialty food items in a small online shop. At the top of the NewsMag Lite theme, you can add a slider that displays your featured news articles with a large, wide background photo. Below, you can display more featured articles in a grid, column, or other layout styles; you can publish both video and article content to address different visitor preferences. Allow website visitors to contact you with a contact page complete with contact forms and a map of where your agency is located. This theme works well for news sites. Using the same features that make it great for news sites, developers can also use it to announce the latest fashions and technologies or the latest developments related to charitable causes. 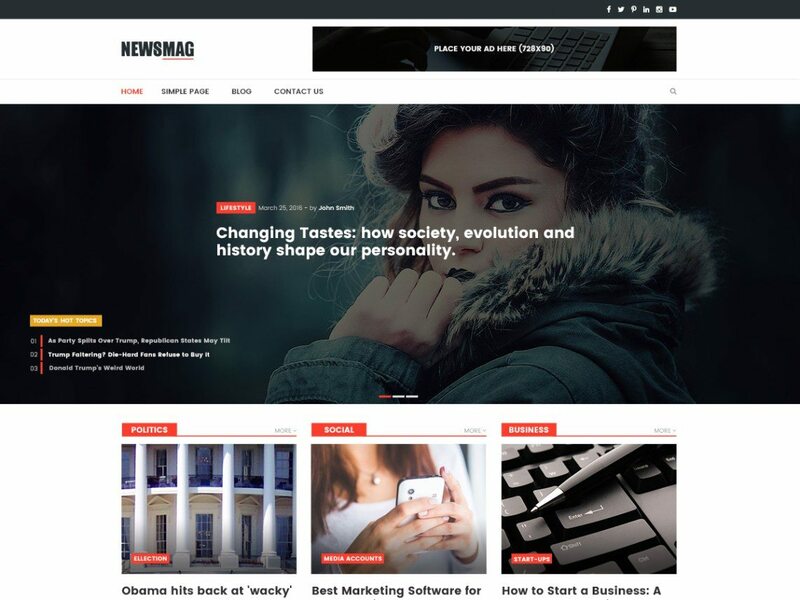 Editorial is a brand-new, free WordPress theme with an incredible homepage design. Using custom widgets (included with the free theme), you can display your latest posts in a unique grid layout. Below that, you can include even more posts in column or list layout—a popular choice if you want to highlight posts from the different categories. Editorial offers an impressive selection of homepage layout options, including pages with a left sidebar, right sidebar, or full-width layouts. You can also add up to four widgets in the footer; these often include sections like a short description of your site, a list of your latest published articles, or tags people can click to follow subjects they’re interested in. In addition, Editorial’s custom ads banner widget allows you to add advertisements wherever you like on your website. 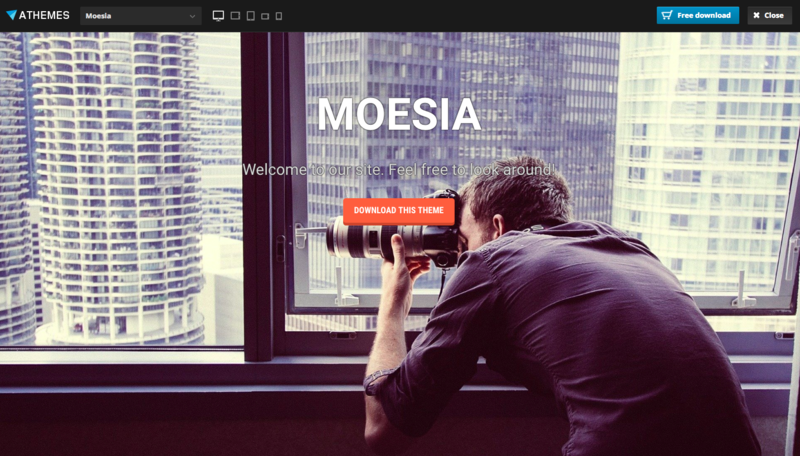 In the Moesia theme homepage, background images can be set using a parallax effect, meaning they remain static as a visitor scrolls down the page. On top of these images, users can add “blocks” or sections of content, including testimonials, recent blog posts, client lists, service types and descriptions, contact information, and portfolios. The theme offers a set of Google fonts, blog layouts, animations, and more for you to design your website. This theme does not offer online store functionality, but does offer a blog for showcasing projects, services, skills, and customer testimonials. As such, it is best for online service businesses wishing to showcase their expertise and encourage website visitors to contact them. These might include marketing agencies, graphic designers, translators, and accounting firms. Storefront is an ecommerce WordPress theme designed by WooCommerce developers. It’s easy to customize the look and feel of your website and its content to match your brand; you can change the default theme colors to your brand colors and change any part of the layout with just a couple of clicks on the sidebar customization menu. You can also display product categories, sales announcements, customer testimonials, and featured items on your homepage. The WooCommerce-enabled store, meanwhile, offers grid displays of your products or pricing tables of your service plans. To build customer trust in your products and services, you can add review sections to these listings. Lastly, add a blog to answer customer questions, tell your brand story, and announce new products. 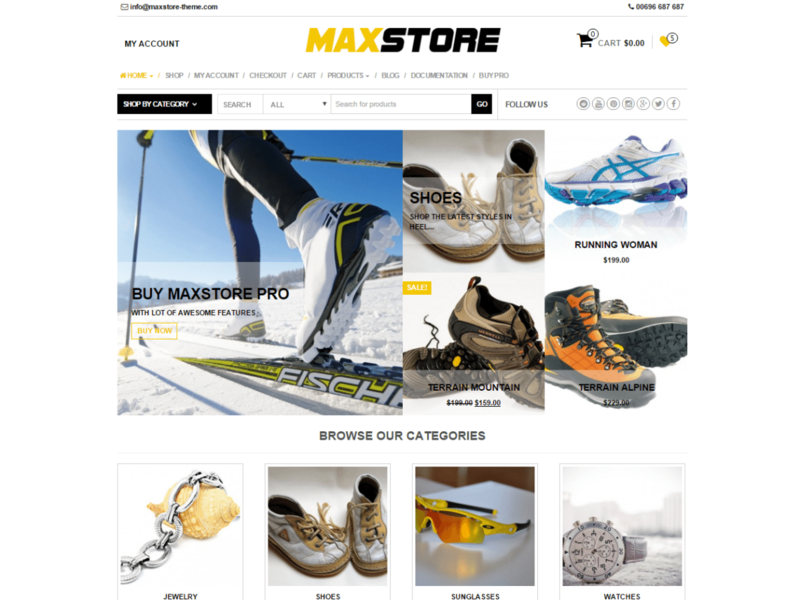 MaxStore can be used to create an elaborate online shop with the help of WooCommerce. Using WordPress’ built-in customization menu, users can easily create and list product categories on the homepage, change product layouts on ecommerce pages, invite customers to contact them via a top bar call to action, change background images and site color schemes, and make products searchable with a sitewide search bar. Visitors will love being able to search for their favorite products quickly and easily, then add them to a wish list they can revisit to purchase as they’re able. 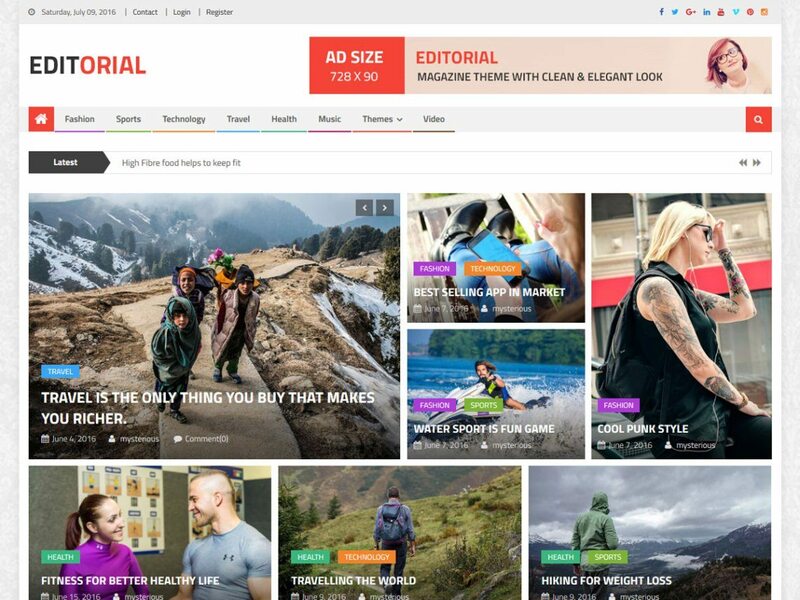 With these ecommerce features, plus image-rich design and easy but deep customization capabilities, this theme is best for hobby or lifestyle brands with products customers like to collect and accessorize, like athletic gear or jewelry. Unite has a what-you-see-is-what-you-get (WYSIWYG) editor, so all you have to do is click and drag web page sections to move or edit them. 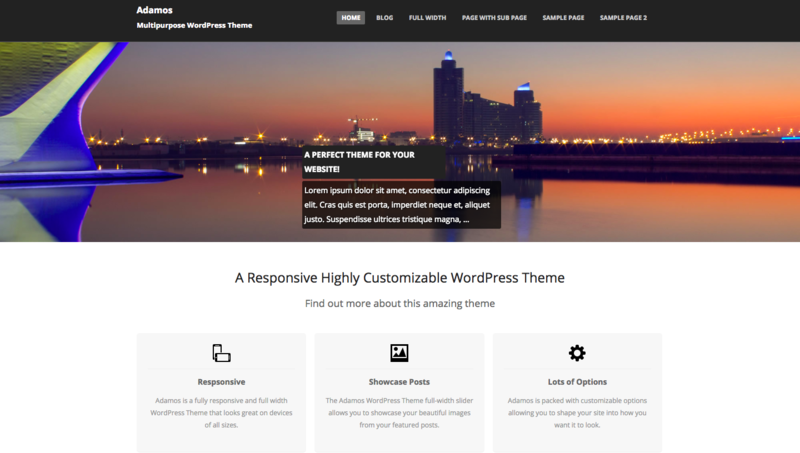 You can customize the theme via unlimited color options, Google fonts, and widget areas. The widget areas are particularly useful for adding social media icons or listing featured blog posts. The theme also features a large slider you can use to showcase fashion items, events you’ve planned, travel destinations, and more. 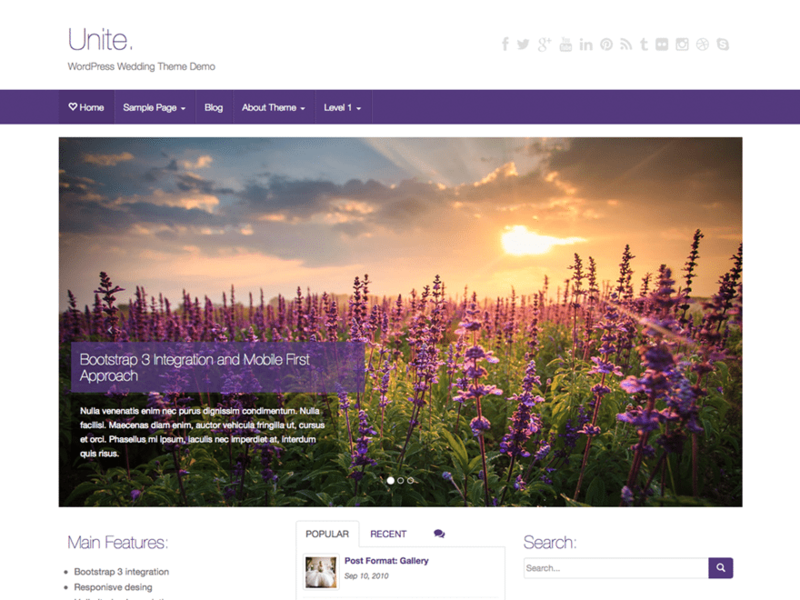 As an image-centric WordPress theme that also integrates with WooCommerce, Unite is ideal for businesses wanting to showcase products and services on a wide image slider and also sell products in an online shop. While it was designed for weddings, this theme’s attractive image-centric displays and ecommerce functionality makes it great for travel, event planning, and interior design websites. 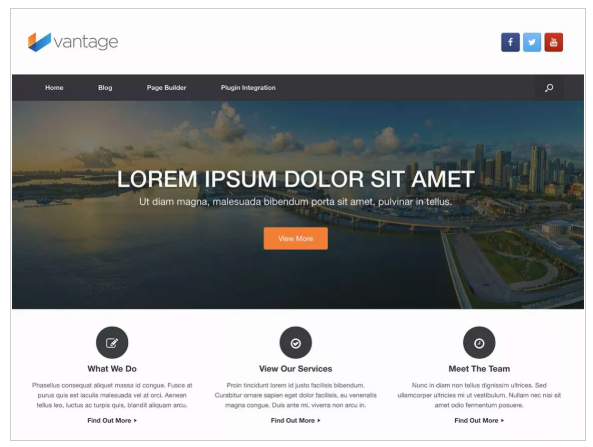 Vantage was designed to be compatible with the popular Page Builder Plugin. 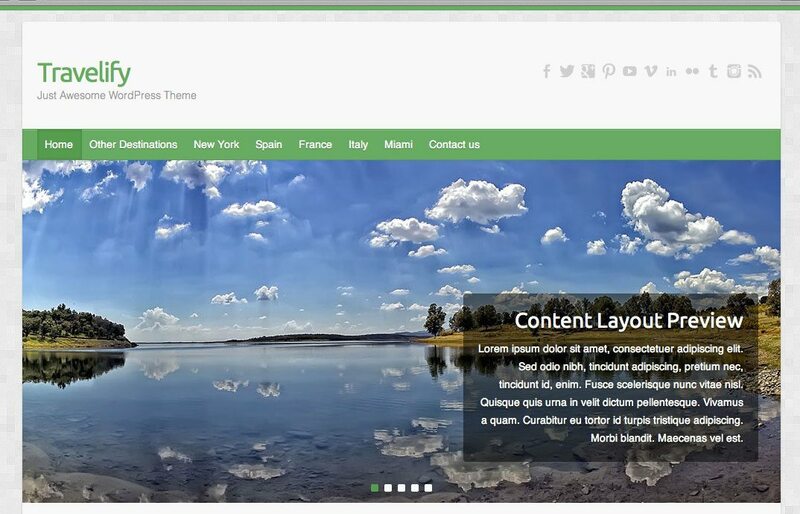 This is a free drag-and-drop, row-based page builder used to add and edit web page sections. You can drag and drop features like sliders, carousels, Google maps, images, pricing tables, content rows, and more. All sections added using this plugin automatically adjust for perfect viewing on any device. 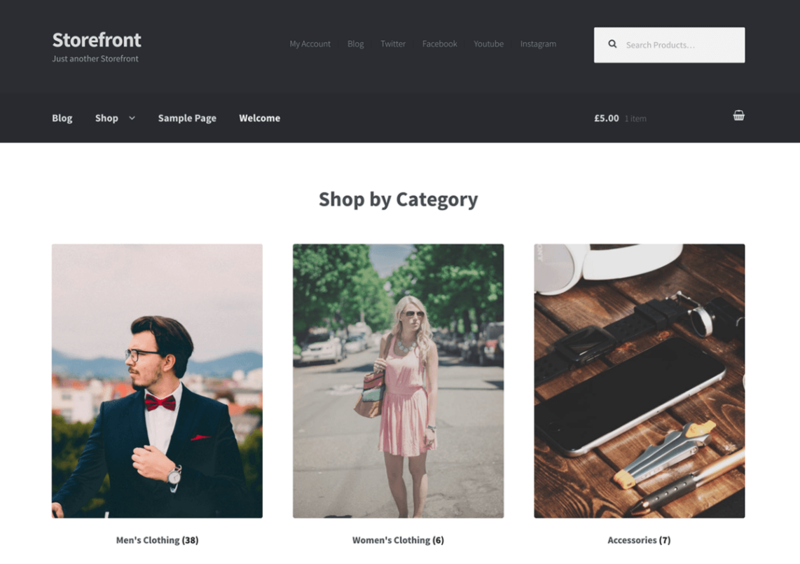 Because the theme is also compatible with the WooCommerce plugin, you can easily use it to set up a website that displays your products, offers a shopping cart, and accepts credit card payments. It also has a database of icons for creating call-to-action buttons that guide visitors through to a purchase. Given the ecommerce capabilities of this theme, it is best for businesses that sell tangible products or plan-based services, like marketers. 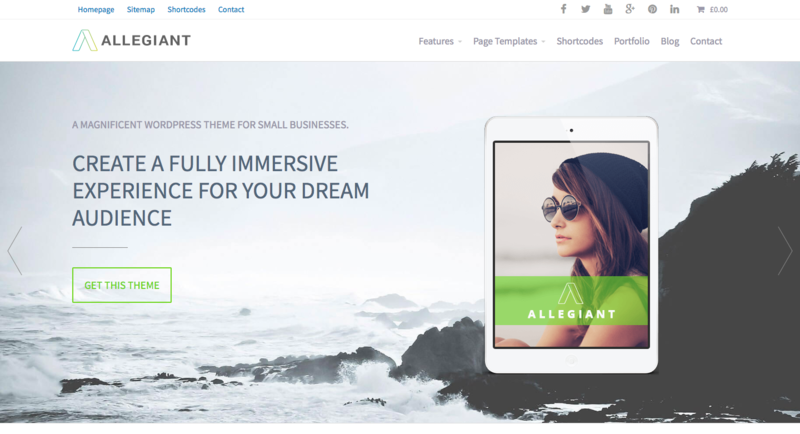 Allegiant is a business theme with a parallax design and drag-and-drop block sections. You can choose a pre-designed page template, then customize it by adding testimonials, featured products, pricing tables, staff bios, contact information, featured blog posts, and other sections. Click on elements to add copy and images, and change color schemes. It is integratable with the WooCommerce, WordPress Multilingual, and Yoast search engine optimization plugins. As a fully customizable, modern ecommerce theme, Allegiant can be used by any online business but is best for service businesses that also sell complementary products. For example, fitness coaches who offer personal training can showcase their expertise and also sell fitness products like DVDs, books, or fitness equipment. 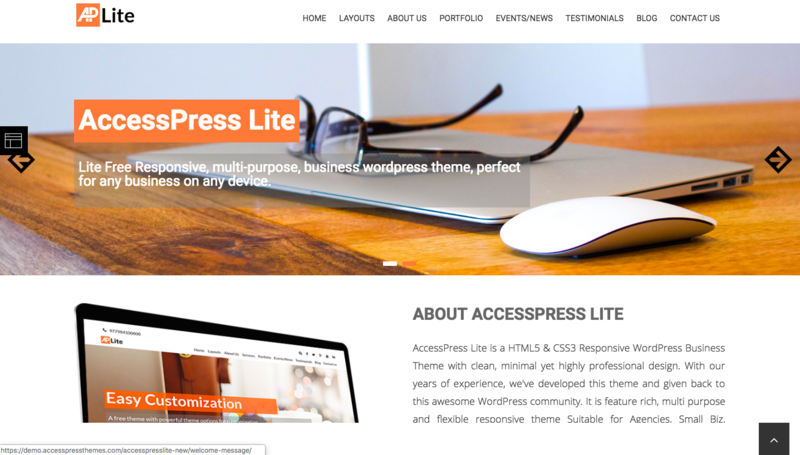 The AccessPress Lite theme offers a plethora of page layout sections you can customize to showcase your products, services, and expertise. You can then create a community around your offerings by adding a website forum. To build credibility and acquire new members, showcase projects or customer experiences via a gallery, staff bios, customer testimonials, and products, then add call-to-action buttons so customers can buy products or learn more. With sections to describe your business products or services, ecommerce store functionality, and forums, this theme is best for businesses with products or services around which people love to create a lifestyle. For example, a yoga website can create a community around healthy, mindful living, and a travel booking business can create a community around world travel. Enigma offers plenty of ways to showcase specialty products and build a community around them. Start a blog to showcase your how-to guides and pro tips for using your products. You can also allow guest posters to showcase how they use your products. Take this a step further with Flickr photo galleries and carousel sliders that showcase products beautifully. You can also use the WooCommerce plugin to set up and run an online shop. This theme offers brand promotion features, including social media icons and blog posts. If you combine its photo galleries, blog, sliders, and WooCommerce plugin compatibility, you can create a very successful online fashion or interior design boutique, then showcase how your products are used via breathtaking sliders. Given these features, this theme is best for small businesses with highly visual products. 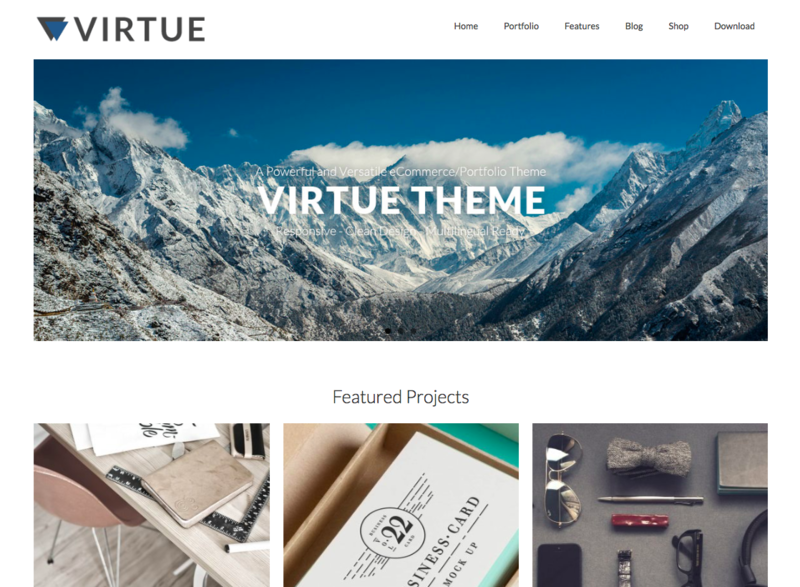 The Virtue theme is modern, clean, and elegant. You can add sliders of featured projects to both blog posts and the homepage. Plus, the homepage features a header slider for showcasing your latest posts so all readers stay in the loop. In addition, you can add the WooCommerce plugin to set up an online shop to sell service plans. Or, use the portfolio page to give customers a peak at your latest projects and entice them to hire you. This theme is best for businesses that need a gallery-based portfolio to display their projects or services. With ecommerce functionality, it also allows service-based businesses to set up a storefront for selling plan tiers. 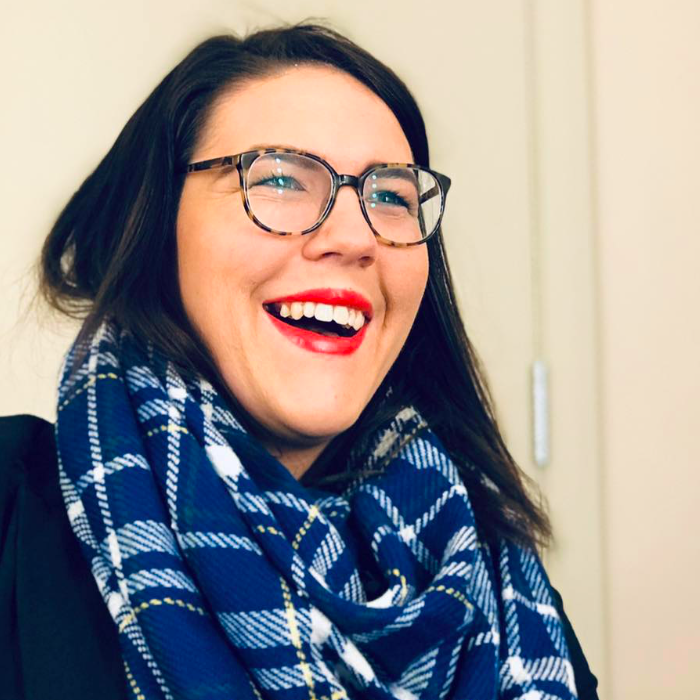 For example, a photographer, graphic designer, illustrator, or event planner could use the gallery to showcase their best work and then set up a storefront to offer service plans to potential clients. A WordPress theme is a pre-designed template used by those with limited technically ability to easily and quickly design a website. 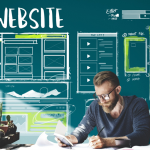 The best free WordPress themes for business leverage sleek design with intuitive site builders and offer space for contact information, products, a blog, and dynamic photos. Additional ecommerce functionality means businesses can build online stores to boost revenue. 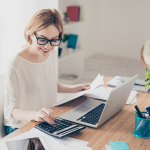 Now that you’ve found a super-affordable way to design your website, you’ll also need small business budget-friendly hosting and domain registration solutions. For just $2.95 per month, Bluehost provides web hosting, a domain name, and one-click WordPress installation capabilities. Click here to get started with Bluehost web hosting for less than $3 per month.